Baby Girl went for her 4th acupuncture session (I didn’t take photos at her first session) today. It had been awhile since we had seen Dr. B and I could tell that BG was weaker in the back end. When we first arrived, Dr. B evaluated her reflexes and responses to see how she was doing since her last treatment. 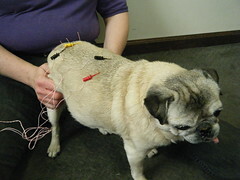 Then, the acupuncture needles were inserted in various locations along Baby Girl’s spine. 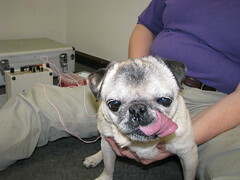 I’ve never had acupuncture myself, but it is apparently VERY stimulating. Baby Girl proceeded to pass gas the entire time. It went from being funny, to embarrassing, to concerning. Dr. B refereed to Baby Girl’s belly as a hot air balloon! LOL!